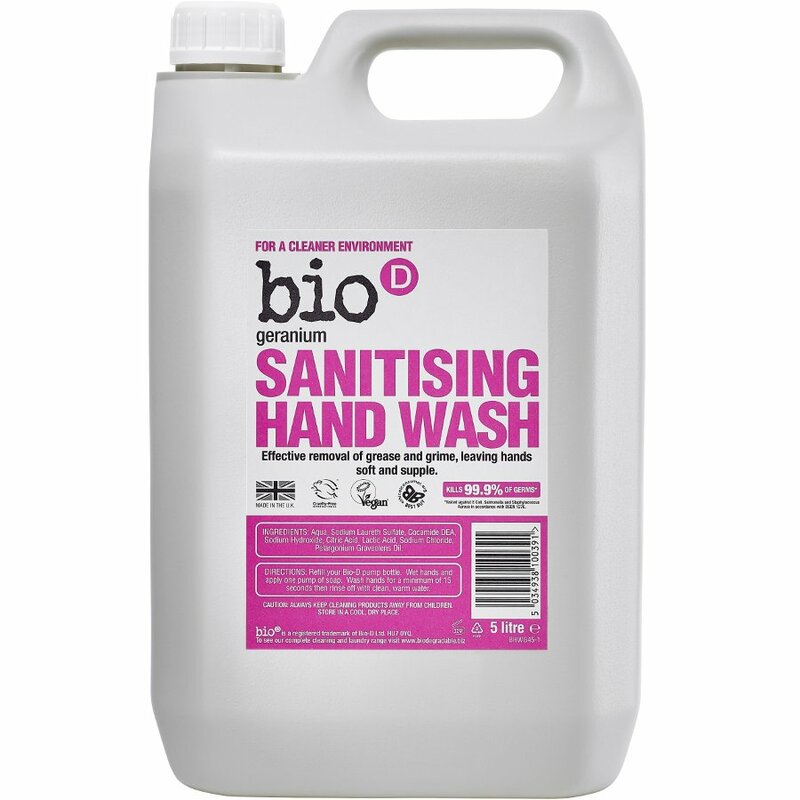 This 5L hand sanitiser from Bio D kills 99.9% of gems while also being gentle on skin and hypoallergenic. It has been naturally derived from raw materials and contains no petrochemicals, phosphates, preservatives, enzymes or synthetic perfumes. The sanitiser is suitable for a range of uses including domestic, offices to catering. Directions for use: Wet hands and apply one pump of soap. Wash hands for a minimum of 15 seconds, and then rinse with clean warm water. Aqua, Sodium Laureth Sulfate, Cocamide DEA, Sodium Hydroxide, Citric Acid, Lactic Acid, Sodium Chloride, Pelargonium Graveolens Oil. The Bio D Hand Sanitising Hand Wash - Geranium - 5l product ethics are indicated below. To learn more about these product ethics and to see related products, follow the links below. Good alternative to most hand soaps. All the members of the household are happily using this handwash. It's not over-powering but cleans well and does not overly dry out my hands! 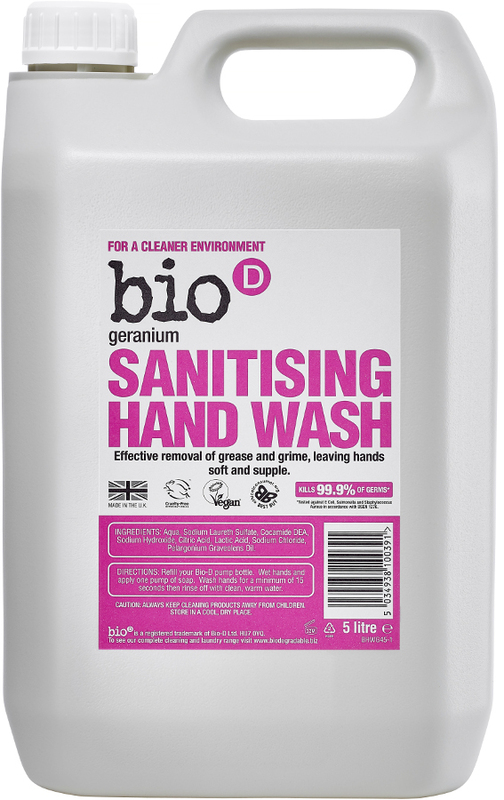 There are currently no questions to display about Bio D Hand Sanitising Hand Wash - Geranium - 5l. Bio-D is an independent, family-owned, ethically motivated company, dedicated to promoting the use of hypoallergenic, environmentally responsible detergents that have a minimum impact on the ecosystem both in their use and in their manufacturing process. Where possible, all raw materials are plant-derived and are obtained from renewable sources. All Bio D products are made in the UK. Bio-D operate a strict policy whereby none of their raw materials or finished products are tested on animals and have a fixed cut-off date of 1988. All raw materials are free from genetically modified ingredients; animal by-products and the company is subject to scrutiny and approval by The Vegan Society, Naturewatch Trust, BUAV and The World Wildlife Foundation.